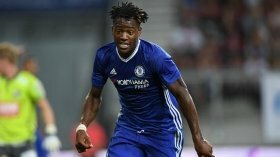 Everton are reportedly leading the race to sign Michy Batshuayi, who has already been deemed surplus to requirements at Chelsea. The Belgian spent the first half of the season with Valencia on loan but his ineffectiveness has witnessed them terminate his temporary deal. Batshuayi is now expected to be offloaded from the Blues' ranks and according to The Sun, the Toffees are heading the queue to pursue his signature. The Toffees have struggled to find a genuine striker upfront with both Dominic Calvert-Lewin and Cenk Tosun failing to score regularly and this seems to have ignited the search for a new marksman. As a result, Batshuayi has been earmarked as the leading target and reports indicate that the Toffees could be prepared to pay as much as £40m for his services. Batshuayi has netted a decent tally of 19 goals from 53 appearances for the Blues but he has failed to establish himself in the top-flight where he has largely been a substitute.